Fr. Richard Hauser, SJ, is a Jesuit priest and theology professor who has also written three books, In His Spirit: A Guide to Today’s Spirituality, Moving in the Spirit: Becoming a Contemplative in Action, and Finding God in Troubled Times. In his writings, Fr. Hauser examines the topics that Catholics discern on a daily basis, including spirituality in our world today, the unique role of the Holy Spirit, and understanding the suffering humans experience. Born and raised in Milwaukee, Wisconsin, Fr. Hauser is the oldest of six children. He entered the Wisconsin Province of the Society of Jesus in 1955 and was ordained a priest in June of 1968. Fr. 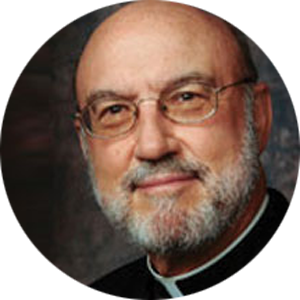 Hauser has a bachelor of arts in philosophy and a master’s degree in American history from St. Louis University, and a doctorate in religion and religious education from The Catholic University of America. Currently, Fr. Hauser teaches a variety of courses at Creighton University at both the undergraduate and graduate levels. He also provides workshops for adult continuing education both locally in Omaha and nationally. Each event focuses on helping attendees to grow in their spiritual life by offering reflections on topics such as contemplation, discernment of spirits, and the spirituality of suffering. Fr. Hauser is interested in the history of spirituality, mysticism, Ignatian spirituality, and ministerial priesthood. Interested in bringing this author to your city?